This image of the Friends Meeting House on the Southwest corner of 2nd Street and High Street was drawn in 1830. Built in 1696, the Meeting House was erected near the prison. 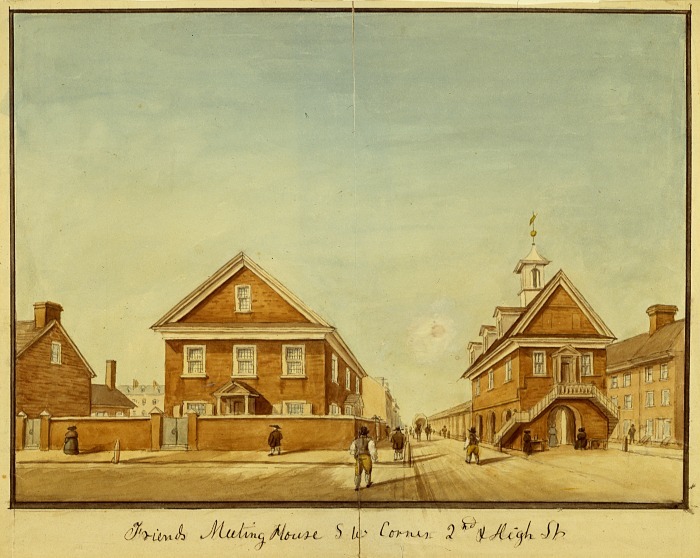 The Society of Friends sold the building and moved to the newly constructed Meeting House at 320 Arch Street, which is still in use today. As early as 1732, the city drew up a noise ordinance restricting gatherings and noise-making on Sundays, possibly for the peace of the Friends’ worship services. 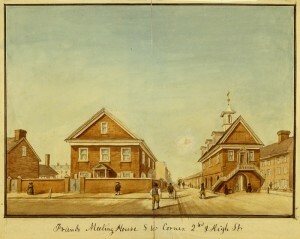 Maintaining silence within the Friends’ meeting house amid the street noise of children, dogs, and carriages at Second and Market Streets remained challenging as the city grew, leading the Friends to abandon the meeting house in 1808. This image published in 1945 celebrated the 250th anniversary year of Christ Church. 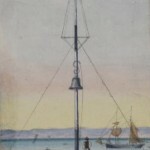 It shows the church’s chime of eight bells which were commissioned in 1754 to hang in the new steeple designed by Robert Smith. 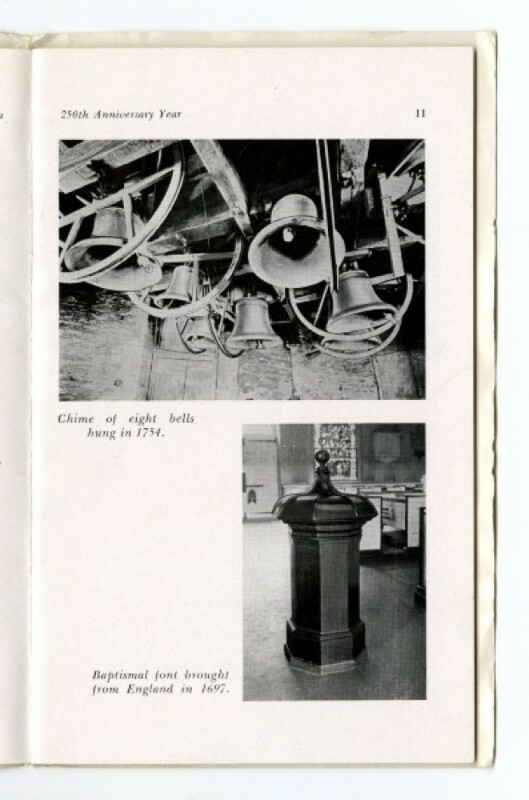 The bells were cast in England at the Whitechapel Foundry. 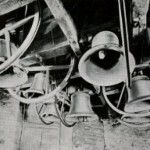 Bells were a common means of sonic communication in the colonial city, present in churches, clocks, schools, and atop the Court House built at Second and Market in 1707. After 1751, the soundscape also included the State House bell, later called the Liberty Bell, which called members of the Pennsylvania Assembly to work. Prior to the construction of the Old Court House at 2nd and Market Streets in 1707 the Great Town Bell was attached by a bracket to a mast. From this location it rang on the occasion of Royal and Provincial proclamations, the arrival of provisions, and was rung by the town crier to mark the passage of time. Soon after its founding, Philadelphia quickly crossed the threshold from a mere rural agglomeration into a true city, complete with an urban soundscape. In contrast to the countryside, where large distances and tree lines weakened the intensity of sound traveling between farms, within the city neighbors had no choice but to hear the diverse noises that resulted from both private and public endeavors. Despite William Penn’s vision of a city spread between the Delaware River and the Schuylkill, Philadelphia remained densely concentrated along the Delaware throughout the eighteenth century. Sounds from the private sphere and public life blended and intruded without hindrance: women’s batting staffs, street criers, and bells sounded loudly throughout the city’s domestic, commercial, and religious life. At the intersection of Second and Market Streets, a center of early Philadelphia’s civic life, the soundscape quickly began to diverge from that of the countryside. As early as 1682 it was the site of a simple cage for the city’s criminal offenders with no sound insulation whatsoever, and a later prison built in the middle of Market Street was labeled a nuisance by the city’s Grand Jury in 1702. The area also resounded with the bleating of sheep, which were pastured on the common area by the town butcher. Plenty of human noise followed as well when Philadelphia’s market was moved from Front Street to Second Street. A bell rang out to signify the opening of the market, which quickly gave Market Street (originally called High Street) its name. Bells were a common means of sonic communication in the colonial city, present in churches, clocks, schools, and atop the Court House built at Second and Market in 1707. After 1751, the soundscape also included the State House bell, later called the Liberty Bell, which called members of the Pennsylvania Assembly to work. The Court House steps at Second and Market served as the site of the some of the earliest sermons in the city by the Reverend George Whitefield (1714-70), whose loud voice drew crowds outdoors. Preaching in London in the 1730s, Whitefield had drawn outdoor audiences estimated at the time from 20,000 to 80,000 listeners. When Whitefield arrived in Philadelphia in 1739, a skeptical Benjamin Franklin (1706-90) decided to test the accounts by experiment: while Whitefield preached from the Court House steps, Franklin walked east on Market Street and reported that Whitefield’s voice remained intelligible until he arrived at Front Street. Using this distance, Franklin calculated that Whitefield’s voice could have been heard by more than 30,000 listeners. In contrast to the riotous atmosphere at many taverns, the upper echelons of Philadelphia society preferred the more subdued conversation at the city’s growing number of coffee houses, including the famous London Coffee House at the corner of Front and Market Street, which opened in 1754. It began as a place for civil conversations and business transactions between merchants and traders, but this led to the Coffee House’s use as an all-purpose auction house for horses, carriages, and even slaves. This louder commercial soundscape eventually gave way to the crackles of bonfires and shouts of revolutionary mobs: as the conflict with Britain worsened in the 1760s, the street in front of the Coffee House became the site of protests against the Stamp Act and later the burning in effigy of British officials. Carriages and wagons traveling from the countryside to the wharves along the river, as well as the whip cracks of their drivers, continually generated noise. In the first half of the eighteenth century, streets were not often paved, and what pavement there was consisted of what archaeologists call pebblestone, similar to gravel. Dirt and gravel roads provided less rigid surfaces than a hard cobblestone pavement, reducing the noise from cartwheels and horses’ hooves while producing a slight hiss from the small particles of stone sticking to wheels (as in the audio example). But as the city developed more in the second half of the century, streets became more uniformly and solidly paved and wheels were more likely to be lined with iron, both of which increased the radiated noise throughout the city. John Fanning Watson’s Annals of Philadelphia in the Olden Time (1830) included several anecdotes of citizens hearing voices or artillery over great distances, and older residents told him that it was easier to hear distant sounds when the city had fewer carriages and unpaved streets. These sounds, along those of the herds of livestock occasionally moving through the city, ensured that the colonial city’s soundscape was not entirely divorced from the sounds of the countryside. While the carriages heading to the wharves generated noise throughout Philadelphia, the Delaware riverfront provided another diverse soundscape on the edge of the growing city. Taverns and grog shops in riverfront caves contributed to the lower-class reputation of the waterfront through the frivolity, songs, and brawls that went along with their wares. The wharves further infused the soundscape with clanking anchors and chains, the groaning of masts and riggings, the speech of sailors and merchants, and the loading and unloading of carriages, wagons, and ships. While some scholars have argued that colonial Philadelphia was even louder than a modern urban environment, the crucial difference is not the overall loudness over time but the different textures of the soundscapes. Modern city noise is characterized by relatively continuous background noise from engines, generators, and ventilation systems. In contrast, eighteenth-century Philadelphians heard many short, impulsive sounds rising over a very quiet pre-electric background. Only at the busiest times did the colonial city have enough individual sources of noise to blend into anything continuous enough to be perceived as background noise. The rest of the time these sharp sounds would ring out into the foreground of public attention, one of the many growing pains for the young city. Alexander, John. “A Year Famed in the annals of History: Philadelphia in 1776.” In Philadelphia, 1776-2076: A Three Hundred Year View. Port Washington, N.Y.: Kennikat Press, 1975. Bridenbaugh, Carl, and Jessica Bridenbaugh. Rebels and Gentlemen; Philadelphia in the Age of Franklin. New York: Reynal & Hitchcock, 1942. Bridenbaugh, Carl. Cities in the Wilderness: The First Century of Urban Life in America 1625-1742. New York: AlfredA. Knopf, 1964. Bridenbaugh, Carl. Cities in Revolt: Urban Life in America, 1743-1776 (2nd ed.). London, New York: Oxford University Press, 1971. Cotter, John, Daniel Roberts, and Michael Parrington. The Buried Past: An Archaeological History of Philadelphia. Philadelphia: University of Pennsylvania Press, 1992. Franklin, Benjamin. The Autobiography of Benjamin Franklin, Second Edition. Edited by Leonard Labaree, Ralph Ketcham, Helen Boatfield, and Helene Fineman. New Haven & London: Yale University Press, 1964. Gillingham, Harrold, and Solomon Drowne. “Dr. Solomon Drowne.” The Pennsylvania Magazine of History and Biography, 48:3 (1924): 227–250. Griffin, Martin, and William Griffin (Eds.) The American Catholic Historical Researches, Vol. 15. Philadelphia: Martin I. J. Griffin, 1897. Hershey, William. Independence Hall Sidewalk Salvage Project. Archeological Report, Independence National Historical Park, Philadelphia, 1975. Jackson, Joseph. Market Street Philadelphia: The Most Historic Highway in America, Its Merchants, Its Story. Philadelphia, PA: Patterson & White, 1918. Rath, Richard. How Early America Sounded. Ithaca and London: Cornell University Press, 2003. Scharf, John, and Thompson Westcott. The History of Philadelphia, 1609-1884, Vol. I and II. Philadelphia, PA: L.H. Everts & Co, 1884. Snyder, Martin. City of Independence: Views of Philadelphia Before 1800. New York: Praeger Publishers, 1975. Watson, John. Annals of Philadelphia. Philadelphia: E.L. Carey & A. Hart, 1830. Independence National Historical Park Library and Archives, 143 S. Third Street, Philadelphia. London Coffee House Historical Marker, Front and Market Streets, Philadelphia. Old St. Mary’s Catholic Church, 252 S. Fourth Street, Philadelphia. Those of us who work as tour guides in the historic district are all too aware of the noise level of the modern city. Not only the continual background noise, but the sudden blare of a fire engine siren, the roar of a cavalcade of city buses, and the whir of a helicopter headed for Pennsylvania or Jefferson hospitals. Amid these modern machine made noises, there’s a sound that takes me back to a scene that seems to be found in every early 19th century novel set in Philadelphia. 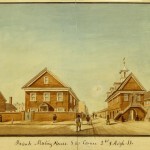 In the early morning hours, after a night of carousing in the oyster cellars of Chestnut Street, the protagonist will hear the ringing of the bell in the tower of Independence Hall and stop to set his pocket watch, thereby putting himself back in order and re-synchronizing himself with the measured rhythm of Penn’s proper, Quaker city.